Most people desire and seek for true love in their life. What is it? Last week we learned God is love. Whatever God is, love is. It is not vague or emotional like the gods of romance. Love is powerful, just, holy, everlasting, and much more. Here again is the definition of true love. Lets take a closer look at this definition so we can know God and true love. Then false gods of love, who cannot fulfill the requirements of this definition, won’t deceive us. It will wait for the object of its affection. Love puts up with the inadequacies and failings of others. It can endure evil and aggravation. Love endures many slights and neglects from the person it loves, and has patience to wait for the good that it believes shall eventually prevail in others through faith in God’s ability to change them. It is gentle. Love seeks to do good even when injured by others. Love seeks the welfare of the one loved. Loving kindness encourages good in another person, bringing out the best in the one who is loved. It rejoices in the successes of others. Love is content with what the Lord has kindly allowed it. Real love is not envious of those who appear to be getting a better break or greater blessing. It is not bloated with self-conceit. Love feels the pain of others. Boastful people have an exaggerated opinion of their own importance and often feel that their happiness and well being is the most important thing in life. As such, it is easy for them to dismiss the needs and feelings of others. Love is not like that; it is not boastful. It will esteem others and limit its own esteem. Love will wait patiently until others praise it. It does not brag about its own accomplishments. Love does not put itself in the spotlight or subtly promote itself. It handles its own prosperity and successes in a humble manner. It behaves with reverence and respect toward all people. Love does not unduly censure or despise other’s conduct. Love will do nothing that is unbecoming. It does not ever ask anyone do something that is contrary to the good principals of conscience, faith, and God’s Word. True love always seeks the best for those that are loved and does not look for personal gain, pleasure, or control. It is the opposite of selfishness and it does not seek its own praise or profit. Love often neglects itself for the sake of others because it prefers the welfare of others before itself. Love is self-sacrificing. Phil 2:3-4 Do nothing out of selfish ambition or vain conceit, but in humility consider others better than yourselves. Each of you should look not only to your own interests, but also to the interests of others. It is not sharp tempered. It calms and softens. Love is not quick to display its passions. It confines them within proper limits. Love is never angry without a truly just cause, and even then, love’s purpose is to do good. It has no malice, thinks not of revenge, and holds no grudge. Love does not ascribe guilt to others by inference or innuendo. It is not jealous or suspicious. It will only believe a poor opinion of another with sorrow and reluctance when the evidence can not be reputed. Love will always think the best it can even when circumstances might appear damning. It does not store up a memory of wrong doing. It takes no pleasure in hurting others. Real love cannot treat evil as an alternate lifestyle, but hates the evil and not the doer. Love wishes ill to none. Nor will it rejoice in the faults or failings of others. In fact, the sins of others will stir all its compassions. Love does not gossip or publish the news of someone else’s shame. It does not find delight in anything God says is wrong. It is happy in the success of the Gospel and rejoices to see people molded by it. Love takes no joy in the sins of others but is highly delighted to see them do well because they walk in the truth. Love wants to see truth and justice prevail. Love covers as a shield or roof to protect. It does not publish the faults of another. Love will put up with injuries, without indulging in anger, or cherishing revenge. Love will put up with all manner of hazards and difficulties. Love even gives the unrepentant sinner an advocate and intercessor who prays for their well-being. There is no fear in love. While not naive, it will stretch beyond appearances to have a kind opinion. Love will forgive and provide another chance to repent and walk in the truth. Love trusts that the consequences of sin God has decreed are His loving disciplines, leading to blessing for those who repent. Love does not fear the possibility of getting hurt, losing possessions, or going farther than planned. It allows God, who is love, to have control. It does not give up when others might. Love knows that failures are not final, and does not bend to the popular negative opinion. It understands that God can do all things and does not give up when situations seem impossible. Love is undying optimism through faith in an all-powerful God, providing hope to the hopeless. Though it mistreated, unappreciated, unreturned, and unevenly matched, true love remains steadfast. Through insult and abandonment, trials and tribulations, true love remains - it does not give up, it does not walk away. It may be shaken, but not broken. It is a permanent and perpetual grace. Love always overcomes. It always wins out in the end. Love will always persevere and reside with us, even in Heaven. While all other things must fall away someday, love alone remains and is the parameter by which we shall be judged. 1 Jn 3:16-18 This is how we know what love is: Jesus Christ laid down his life for us. And we ought to lay down our lives for our brothers. If anyone has material possessions and sees his brother in need but has no pity on him, how can the love of God be in him? Dear children, let us not love with words or tongue but with actions and in truth. 1. He demonstrated love, by the way He lived. • He loved the touchable – He loved the untouchable - He loved everyone. 2. Jesus demonstrated love by the way He died. WHEN – He, who has never been bound by time, all of the sudden becomes limited by the clock, He could have said, ‘on second thought, I don’t think so…this is so not me’. He could have given up WHEN – the crowds left because His teaching became too hard. AND even WHEN – He hung suspended between Heaven and earth…He could have quit loving us, but He didn’t. Why did Christ endure treatment like that? Love is why He endured this treatment. He is true love, and He wants us to experience Him. Our problem is we don’t know what true love is. We are looking for love in all the wrong places and in the wrong people. Jesus is our last choice because we doubt He could love us, especially since we have not loved Him. This is where we have been deceived by false gods of love. God is love and we are clueless about what love is and as to how much God loves us! When we finally realize God is love and we are loved by God, accepted despite our sins, our shortcomings, our failures, our past, and loved not for what we do… OR for who we are… it should cause us to seek an intimate relationship with Him. Isn’t this the kind of love we all desire—to be loved completely and unconditionally? Maybe we are afraid of love, because we fear love will change us and we don’t know what we will become. Love will change us. 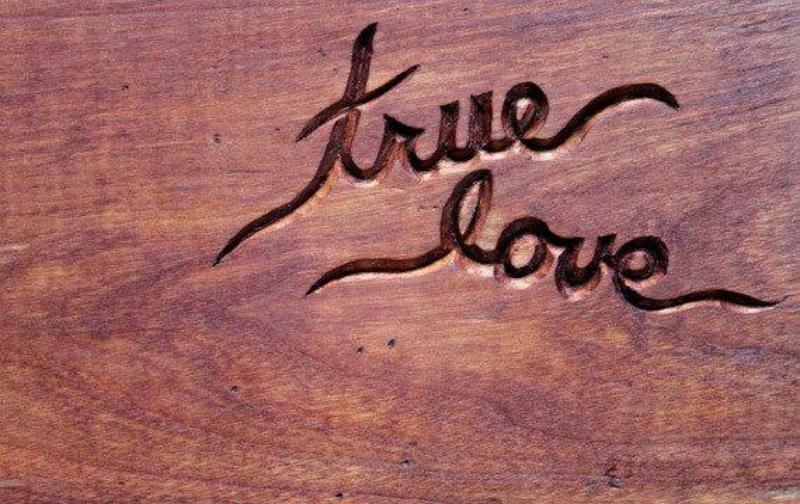 This true love turns sinners into priceless treasures. God loves for reasons that no one can ever quite figure out, and His love makes that person precious and valued beyond calculation. This is a love beyond reason. This is the love with which God loves you and me. This is the love God wants to fill us with and extend to the whole world. The truth is – we are incapable of loving this way without God abiding in us and empowering us to love. Even Jesus was empowered by this same love when the Holy Spirit came upon Him at His baptism. Matt 3:16-17 As soon as Jesus was baptized, he went up out of the water. At that moment heaven was opened, and he saw the Spirit of God descending like a dove and lighting on him. And a voice from heaven said, "This is my Son, whom I love; with him I am well pleased." Do you know true love? Does God, who is love, abide in you? Sin can make you feel unworthy of love. Why not confess it and repent so you can experience God’s forgiveness and love. Come and confess Jesus as your Lord and Savior, give your life to Him in baptism, and be filled with the Holy Spirit, who is love. Then you will have true love abiding in you.